← Who is the Bibi Shirina in Sardar Ali Takkar’s new song, “Ta Bibi Shirina Ye”? 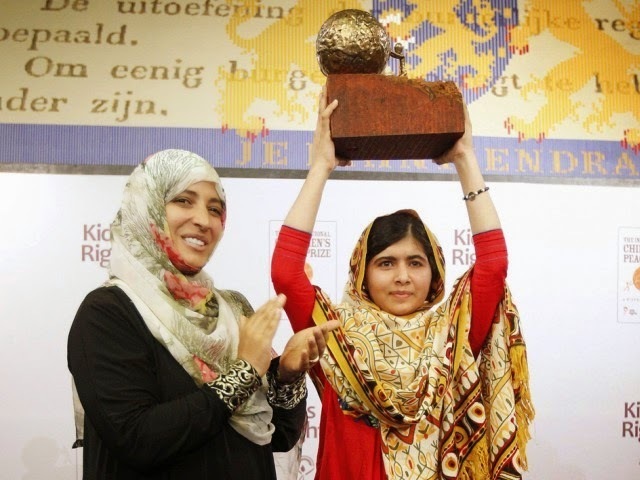 Because today, December 10, 2014, is the Nobel Prize Award Ceremony, and Malala is there along with many other Pashtuns. The post below is basically copied and pasted from my Facebook status about the matter. Since it wasn’t intended as a formal write-up and was written in a rush, there may be many typos and disjointed thoughts. Apologies in advance for those. 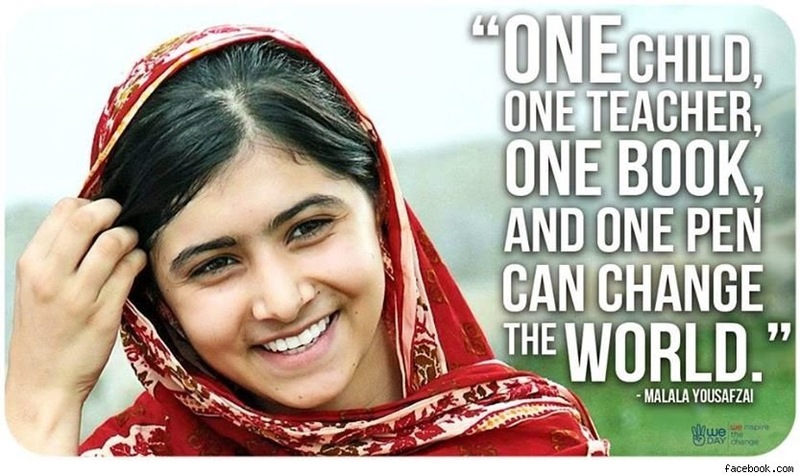 SO INFINITELY PROUD that Malala has won the Nobel Peace Prize!! I was thinking and thinking about reasons why people might suspect she doesn’t deserve this thing, but I have come to find none. There are a couple of points, though, and specifically in response to those who’ve been asking me what I think about Malala and the fact that she’s become the youngest person in the world to win the Nobel Prize (and the first Pashtun person, let alone woman, to do so, and the first Pakistani woman to do so). So here. 1. I’ve been critical of the narrative that the Western media has been feeding people (see How Not to Talk About Malala). Or sheep, should I say. Few have stood up to question it, and that’s mindblowing. No, humans – Malala wasn’t shot “because she wanted to go to school.” I have NO Idea how anyone can appreciate this girl without knowing the context in which she rose to the point she’s at now. Reasons for why she DOES deserve at least support from the world if not the Prize: a) between 2007-2009 during the height of the Taliban’s violence in Swat, Pakistan, where she is from, she spoke up against the Taliban–and the Pakistani army (this last part is one of the reason why some Pakistanis don’t like her; because the PK army is impeccable, and how dare you say anything evil about them, traitor). The Taliban were literally butchering people whom they even SUSPECTED were saying anything critical about them (I have uncles butchered out of mere suspicion, so, yes, it was real.). The effects of their power continue to haunt Swat; Swatis are still afraid of speaking up about ANYTHING because of the consequences they witnessed during the Taliban’s time there. b) As I see it, the Taliban couldn’t harm her at the time she was most active in her condemnation of them when they were in power, but when Malala got the west’s attention, the Taliban decided to something about it and finally carried out the shooting. So, yes, I’ve NO idea how anyone can respect Malala’s cause and think so highly of her when they don’t know the background. That’s a shame, really. Know her story and know it well so you don’t go around believing oversimplified and misguided versions of her story. A still from the documentary “Class Dismissed in Swat Valley” – watch it! Beloved people, it is an oversimplification of Malala’s story to say that she almost got killed for wanting to go to school (girls DO go to school in Swat on a daily basis, and they don’t get killed for it, not even by the Taliban, witches), but the Taliban did attempt to silence her. This was an intimidation technique to silence her and her supporters – and it bit them in their asses, so, like. 2. It’s heartbreaking that Pakistan and way too many Pakistanis don’t support Malala because they’re too immersed in their conspiracy theories claims. I’m even hearing things like, “America shot her, and they barely shot her” (I know, I know – you can’t even laugh at this thing). 3. Her father needs more recognition than he’s been given. This man is a hero, and I understand when people say, “He threw his own little daughter to the wolves” and “He used the image and voice of his own child to grab people’s attention about the Taliban’s atrocities,” but, really, very little was being done about the Taliban. Her father felt like, I suspect, that he had no choice – and it was successful, wasn’t it? Yes, it was dangerous. 4. Yes, Malala’s worth is no more and no less than any other victim of violence, and it’s highly unfair that even the two girls who were shot with her didn’t get the same kind of treatment and attention that Malala did – and Malala herself was critical of this (which further adds to her greatness). All victims of injustices deserve equal treatment. But that doesn’t take away from the fact that Malala’s voice has been powerful amidst the violence in Swat years ago. 5. Yes, it’s absolutely wrong that the West thinks it’s totally okay to kill children in wars (and through drones in Pakistan, for example) but the moment an enemy of theirs (that’s a product of something else they created–the Mujahideen), like the Taliban, kill a child a or attempt to, it’s a big deal and let’s go destroy the whole nation, literally or metaphorically, as by falsely representing them through the most powerful media in the world. 6. She’s already got the Prize, and there’s nothing anyone can do to take it away from her. The very least you can do, for those who don’t support Malala and believe in conspiracy theories about her, is to not speak ill of her, her father, or anyone who supports her. 7. Meh, the first Pakistani person to win a Nobel Prize was a physicist named Abdus Salaam in 1979 for his work on subatomic particles; an Ahmadi, he has no recognition in Pakistan, and ALL that Pakistan and most Pakistanis see is that this guy was an Ahmadi, a sect of Muslim seen as heretical. So we’re going go ahead and ignore this man’s accomplishments and work for humanity all because he doesn’t belong to the “right” sect of Islam. All this to say, screw all of you who think Malala isn’t important, doesn’t matter, has done nothing worthy of respect or glory, etc., etc. Because I have no good expectations of a lost people who think someone should be killed because they’re an Ahmadi. That’s all I could think of. I’ll say more as it comes to mind. Peace to all! This entry was posted in Death to patriarchy, human rights, I can't believe this needs to be said out loud, Pashtun Leaders, Pashtuns and tagged Malala haters, Malala Yousafzai, Pashtun Leaders, Pashtun women, Pashtuns. Bookmark the permalink. 8 Responses to Why Malala Yousafzai Deserved the Nobel Peace Prize – and stop simplifying her story, folks. Well written! She was for the longest time she untraceable. She wrote under the pseudonym Gul Mukai. TTP would have silenced her long before she got her publicity. Many fake Pakhtuns are against her because she is causing awareness to women and their rights. Lets face it, how many women in the Pakhtun society really get their due share in inheritance matters? Or any other right for that matter? First step is education. An educated woman is a very power force. As for the Dr. Salam, its very sad that this person who did everything for Pakistan is not recognized for his contributions. #Malala haters also point out that she is a girl(as if being female is a curse) and malign her character for being one. Its sad and frustrating at the same time. Its one stupid thing or another but no one can argue with her message and cause. I have the utmost respect for Malalas courage, greatness & humanity. I think that she became the best person she could have under the circumstances. But………and yes, here comes a critical remark. I read part of her book. And in that book, she referred to “playing make-up” with a friend which bleach creams and as-a-matter-of-factly referred to the fact that her father thought he was ugly because he was dark. And she didn’t question the practice of bleaching and the whole sickening ideology behind it. That really put me off, actually. Maybe asking that of a girl her age & in her circumstances would be too much, but still…………. I haven’t read her book yet, but I will at some point this summer, inshaAllah. So her father recited this verse to her after she woke up from her surgery, expressing pride in the little girl. Malalai thought about it and told her father that she found the verse too sexist, that she rejects it, doesn’t like it, and said: “No, I don’t like that. I have my own: ka da zalmo na shi ka na shi, grana watanan jinakai ba de gateena.” [Rough translation: “Whether the boys do it or not, dear homeland, the girls will take fight for you”] She was like why does it have to be men’s responsibility to do it and women be only the back-up? So she’s definitely a critical thinker. I don’t wanna imply that because she can think critically about some issues, she should about ALL other issues, too, but you’re right – how does she not comment on the problem with skin-bleaching to look white? I’ll meet her one day and we’ll talk about this! And yes, she deserved the Nobel Peace Price for her amazing work. If you look at the present landscape of Pakistan you will see there are three powerful constituencies running the country. The politicians, the military and the mullahs. The military and politicians may be I charge but the mullahs control the power. All because of Zia. Aurangzeb brought down the Mughal empire, Bhotto dismantled Pakistan and Zia brought extremism. Mullahs in Afghanistan and KPK want women to be slaves and cows to produce more gullible people. Malala was shot because she became a threat to them. Yes some go to schools but don’t forget how many schools were blown by them. How many young girls were disfigured by acids thrown over them by Taliban? How many female artists were murdered by these animals? Malala is being demonized by these mullahs. Incredibly the head of JI, Siraj, said, ” what she has done to deserve Nobel prize.” One should ask him what he has done? Prize is not given for charity otherwise Bill Gates would have won dozens of them. It was given for standing against tyranny, extra ordinary courage and what impact had on the world. Her contribution is mind boggling. She brought incredible honor to pukhtuns, KPK and Pakistan and these imbeciles are demonizing her. They succeeded doing the same thing to Salam. The Indian Kailash was received with tremendous honor in India but strangely the Pakistani govt failed to honor her, only because the real power brokers are the mullahs. The military and politicians may hold the jobs but the real power is somewhere else. They can’t get rid of that burqa mullah in all masjid. I feel sorry for Pakistan.